Trees , to 25 m; trunks straight and erect to inclined or basally reclining or prostrate, to 1.2(-2) m diam., lower branches becoming thick, contorted. Leaves: stipules entire to somewhat dentate. Leaf blade dark green, deeply 3-5(-7)-lobed, 9-25 × 9-30 cm, rather thick; lobes of blade much longer than wide, basal lobes usually smaller and spreading, not reflexed, sinuses broad and very deeply concave, depth of distal sinuses equal or greater than distance from sinus to base of blade, terminal leaf lobe about 2/3 or more length of blade; margins entire to serrulate, apex acute to acuminate; surfaces abaxially and adaxially glabrescent. Pistillate inflorescences: heads (1-)2-4; fruiting heads to 20 mm diam., lateral heads sessile or pedunculate, peduncle often eventually obscured by maturing achenes; fruiting rachis to 25 cm. Achenes 5-8 mm, basal hairs about 2/3 or equal to length of achenes. 2 n = 42. Flowering spring; fruiting late fall. Often abundant in riparian forests, especially in montane canyons, extending into deserts along streams and near springs, and cultivated; 600-2000+m; Ariz., N.Mex. ; Mexico (Chihuahua, Sinaloa, and Sonora). 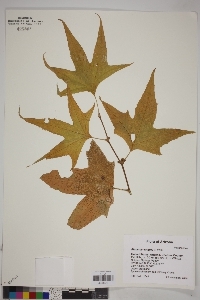 L. D. Benson (1943) reported intermediates between Platanus wrightii and P . racemosa in southern California. He reduced P . wrightii to P . racemosa var. wrightii (S. Watson) L. Benson. Most authors have retained that taxon at the specific level because of its more deeply lobed, more glabrate leaves and its often pedunculate fruiting heads. Very low yields of germinable seeds were obtained from crosses of P . wrightii and P . racemosa with P . occidentalis (F. S. Santamour Jr. 1972b). Plant: tree; 10-25 m high; trunk 6-20 dm in diameter; bark greenish-brown, peeling to reveal whitish inner bark Leaves: broadly ovate, 10-25(-30) cm long, about as wide as long, palmately divided usually below the middle into 3-7 lobes, the lobes long and attenuate, entire or dentate; base cordate or truncate, occasionally wedge-shaped; upper surface light green, glabrous or slightly pubescent; lower surface paler, sparsely to densely tomentose, especially when young; petioles 5-10 cm long; stipules foliaceous, sheathing, entire or dentate, sometimes lacking INFLORESCENCE: of 1-4 heads in pendant axillary or terminal racemes; peduncles 2-3 cm long; staminate heads dark red, on axillary peduncles; pistillate heads green to red, on terminal peduncles Flowers: appearing with the leaves; sepals of staminate flowers 3-6, tiny scale-like; sepals of pistillate flowers(3-)4(-6), rounded; petals longer than the sepals, cuneiform, scarious; stamens elongate-ovoid; ovaries sessile, oblong, persistently hairy at base; styles red, papillose, stigmatic to below the middle Fruit: FRUITS in heads 1.5-2.0 cm in diameter, on peduncles 10-20 cm long; achenes elongate, obovoid, truncate, 5-10 mm long, surrounded by long hairs; styles persistent; SEEDS elongate-oblong, pendulous Misc: Along streambanks in canyons; 600-2450 m (2000-8000 ft); Mar-May REFERENCES: Laferriere, Joseph E. 1994 Platanaceae. J. Ariz. - Nev. Acad. Sci. Volume 27, 238.